"The street corner that started the 20th century. 1914 - 1918"Sarajevo hosted the Peace Event, 6-9 June, which brought together around 900 people from 32 countries. Weighing in for the experienced generation were the likes of Mayors for Peace and Pax Christi, while at the youthful end of the spectrum many international young people, including young Bosnians, were drawn by a creative and dynamic youth camp. The Peace Event was a statement that 'peace is possible'. In scores of workshops and round-tables ideas were exchanged on alternatives to militarism, violence and war. In my journey to Sarajevo from Germany I crossed the Bosnian border on a brilliant morning, to be immediately confronted by the effects of the disastrous floods that only two weeks earlier had destroyed homes, gardens and streets. Nobody had foreseen this disaster, and many, unable to escape the rising waters in time, lost their lives. Now, as we followed the course of a river once again returned to a gentle flow down a romantic green valley, we learned how local communities had helped each other during this emergency, in a way that seemed to attest to a degree of reconciliation between the war-torn communities of Bosnia-Herzegovina. Yet memories of the Bosnian war of the nineteen-nineties were evoked continually as we passed through one village and town after another on the way to Sarajevo. The scars from the conflict are still surprisingly visible. We could only imagine the deeper wounds that must remain in the hearts and souls of the people here. It is still difficult to really understand, despite reading and listening to many analyses and narratives, how this devastating war of ethnic aggression could have come about in the heart of Europe at the end of the 20th century. During our journey to Sarajevo we were obliged to return over and again to the issue of ethnicity. Our driver pointed to three ruined houses standing on the hill beside the road: 'Serbian houses' he explained. That woman coming home from the supermarket carrying bread and tomatoes - who was she? Does the headscarf tell us anything? Who are her neighbours - are they former enemies? Is this area we are passing through still in a war-zone? As we travelled we were warned about land mines remaining from the conflict, some now exposed by the floods. Bosnian's told us stories of war criminals, either unpunished or having served brief sentences, at home in their former communities, so that some victims are obliged to continue living next door to their violators. We heard of the economic stress that has provoked significant social and political street protests in Bosnia recently. 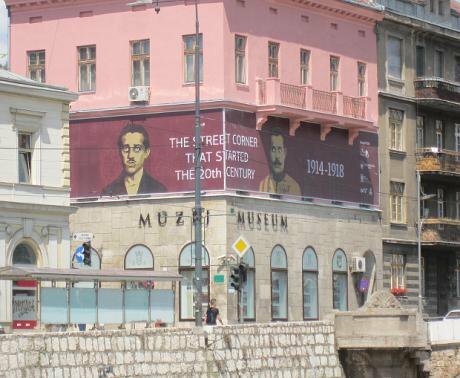 Arriving in Sarajevo, we parked behind the municipal museum at the very street corner where the the Archduke Franz-Ferdinand and his wife were murdered. The museum announces a photo exhibition of World War I. These images recall the millions of victims across the continent - and the inability of the many who saw war approaching to forestall it. They have to be mentally and emotionally processed in parallel with those in a nearby art gallery that recall the genocide in Srebrenica just short of a century later, and the failure of the international community to prevent that. Looking now at the wonderful green mountains surrounding Sarajevo and the lively partying-zone in the city centre, a place for tourists now, it was an effort to re-evoke the two years of Serbian siege, the sniper attacks, the starvation of the city's population. But the extraordinary number of cemeteries in and around the city, with deaths recorded from the years 1992-4, serve as a continual reminder. The Peace Event opened with a strong video message from Noam Chomsky: 'World War I should have been a lesson! ', he said. It closed with a very personal and wise contribution by Sonia Biserko, Serbian author and human rights activist, on the root causes of war. She made strong reference to the many continuing social and political problems in the Balkans, the undiminished nationalisms and xenophobia, and the responsibility they pose for the international community. South African Bishop Kevin Dowling, of Pax Christi, quoted Nelson Mandela's Long Walk to Freedom. There is still a long walk to peace he said, 'but we carry in our hearts the cries of the oppressed and the oppressor that must be answered'. During the Peace Event's many sessions we heard numerous concrete proposals for shared campaigns, such as 'Disarmament for Development' (International Peace Bureau) and 'You Get What You Pay For', an initiative of the Women's International League for Peace and Freedom (WILPF) and were advised of upcoming events, such as the No-to-Nato counter-summit in Cardiff in September, and the World Social Forum in Tunis 2015. These were a source of optimism, giving a sense of the strength of the contemporary peace movement. 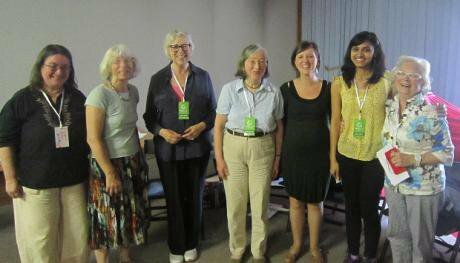 WILPF offered a workshop, led by Helen Kay from Scotland, Tatjana Kurtiqui from Albania, Nela Porobic from Bosnia, Ite van Dijk from the Netherlands and Irmgard Hofer and myself from Germany. Participants were invited to take a closer look at the more than 1200 courageous women who had come together in 1915 at the height of WW1 in an International Congress in The Hague, and who are so often neglected by official history. Helen quoted the words of Aletta Jacobs at the opening of that congress. 'In these dreadful times in which so much hate has been spread among different nations, the women have to show that we retain our solidarity and that we are able to maintain our mutual friendship'. She recalled the women's resistence to war propaganda, their clear-minded and very modern analysis of the root causes of war, such as the accumulation of arms, the pursuit of rival economic interests and the absence of international arbitration. She reminded us of the personal risk they had been taking, and of their twenty resolutions to stop the war in its tracks and avoid all future wars. She said, 'they have a vibrance that continues to resonate today'. The women who after the congress were delegated to carry its demands for a peace process to many of the leaders of both belligerent and non-belligerent countries, could be an inspiration for WILPF's return to The Hague for their centenary congress in April 1915. In my contribution to WILPF's workshop I chose, in contrast to that historical theme, to look to the future. I spoke of the tasks foreseen in our draft centenary Manifesto that we believe will face WILPF in coming decades. The 21st century presents new challenges that call for an ever stronger investment by women in peace. I spoke of the militaristic propaganda supporting casino banking, predatory capitalism and geo-strategic interests in the name of competition for resources. I spoke of growing corruption and unjust distribution, of practices of exclusion, and of environmental depredation. Food sovereignty, access to clean water - in short 'human security' - are vital interests that women will need to defend. It is clear we need a profound political shift away from military responses to crisis and towards the non-violent transformation of conflicts. Above all we must ensure the equal participation of women in negotiation processes and mediation. Nela illustrated this shift by speaking of the recent unprecedented and encouraging peace dialogue WILPF had organized recently, right here in Sarajevo, between Bosnian and Syrian women. 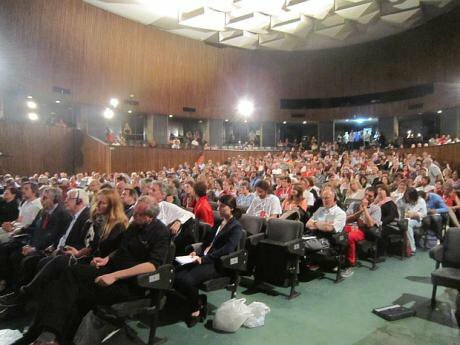 There was also a significant women's seminar offered as a 'side event' to the main Peace Event in Sarajevo. It was organized by the academic network 'Women in War', based in Paris and with a branch in Sarajevo, devoted to the study of gender in armed conflict. Led by WiW's Carol Mann, thirty women experts from all over the world analysed war and genocide through a gender lens, linking scientific research to the grounded experiences of survivors, victims and war-resisters. For example, Carol Mann spoke of how, during the siege of Sarajevo from 1992-4, women had developed a culture of survival and sustained an imagining of a peaceful future. She spoke of Dobrinja, a district of the city that sustained heavy attacks. It was, she said, 'a middle-class environment where ethnicity did not exist before'. During the war it was populated mainly by women and children. The women had organized hospitals, laundries and civil defence. They had shared resources, re-discovered old techniques of food conservation and written a cookbook which they subsequently presented to UNPROFOR. They continued to dress well 'like in Paris', she said, and even 'wore high heels even in the sights of the snipers'. Though schools were closed, adults had gathered children for classes beneath protective staircases. 'Such women are the unknown heroes in all wars! ', she said. We left Sarajevo after the event inspired and encouraged, but in no doubt that there is indeed still a 'long way to peace' but know that, at the same time, 'peace is the way'. Now we are preparing for a continuation of these debates at the forthcoming Women's International League for Peace and Freedom centenary congress in The Hague next April.